More or less an hour and a half away from Malaga to the west, you will find a beautiful little city called Ronda. It is probably our favorite one at this point at least in Andalucia. Do you want to know why? Then keep reading! Ronda is a city which belongs to the province of Málaga, Andalucia. It is around 100 kilometers away from Malaga and has around 35,000 population. The city has a long history dating all the way back to the Neolithic Age. You can find here remainings of Roman Empire and Arab age. Apart from history, Ronda is truly unique by its location. The city is situated 750 meters above the sea level, surrounded by mountains. Ronda is built on the cliff of the River Guadalevín. The cliff is almost 120 meters deep and it is called El Tajo Canyon. 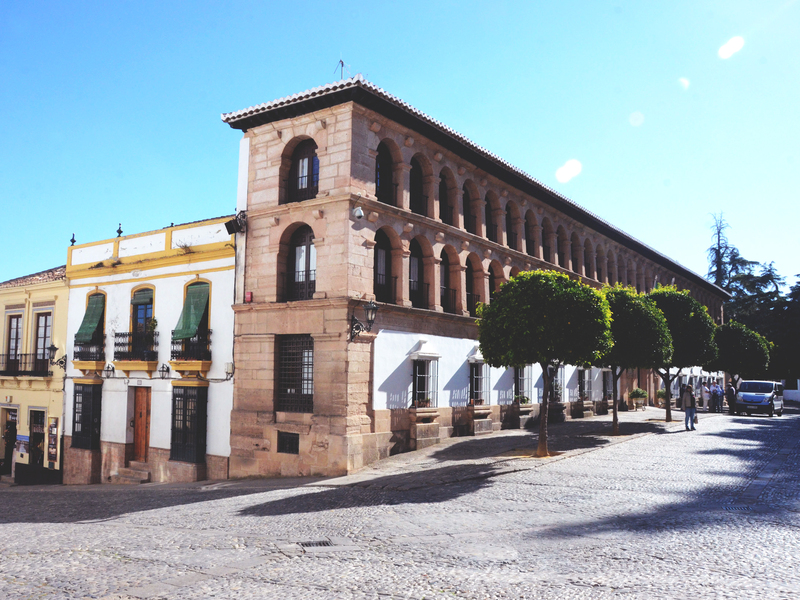 Since Ronda is full of historic vibe and due to its relief the city has a lot to offer to every visitor. Starting with Puente Nuevo, Plaza de Toros, Plaza Duquesa de Parcent finishing with Baños Arabes, Arabic walls and city gates, Palacio de Mondragon. Today we will take a top 3 places which you must visit in Ronda. While in Ronda it is impossible not to see so-called Puente Nuevo. Ronda has 3 bridges which merge the east side of the city to the west. One of them is the Arab bridge which is also called the Roman bridge is the oldest bridge of Ronda. Puerto Viejo is the second oldest bridge in the city which nowadays is used only by pedestrians. However, the most important and the most impressive bridge of Ronda is El Puente Nuevo which name literally means the New Bridge. The bridge was constructed in 1793 after more than 40 years of ongoing construction works. It seems such a long time for construction of one bridge, however, when you take into account that it somewhat imitates Roman aqueduct and it is 120 meters above the river Guadalevín it really makes you understand the gratitude of the work dedicated into this piece of architecture art. To take stunning photos of the bridge you must head to the viewpoint called Mirador Puente Nuevo de Ronda. You will be left out of breath when you will see the great view of Ronda, cliffs and of course the bridge in front of your eyes! Plaza de Toros of Ronda or just Bullfight Ring of Ronda is the oldest Plaza de Toros. It was built in 1785 on the west side of the city. Ronda is super famous for its toreros such as Pedro Romero, and Cayetano Ordóñez and Antonio Ordóñez for whom you can see the sculptures built outside the plaza. Interesting fact about the Plaza de Toros of Ronda is that pop queen Madonna here filmed her music video Take A Bow in 1994. Entrance to the Plaza de Toros will cost you from 7 to 8.50 euros depending on your choice of getting Audioguide or not. More information. Baños árabes de Ronda also known as Baños árabes de San Miguel or El hammam translated as Ronda’s Arab Baths is another very important attraction of Ronda which cannot be missed. Baños Arabes belongs to the Nazari period (s. XIII-XIV) and from design point of view reminds the Romans baths. The interesting fact is that the baths are partially built underground in order to better control and maintain the stable temperature needed for heating the rooms. The entrance to this attraction of Ronda normally costs 3.50 euros per person. You can find more information in Spanish as well as a brochure in English, French, and Spanish here. Already packing your backpack for a day in Ronda? Great, the most important, don’t forget your camera!